During my AT thru-hike, only a few items stuck with me for the entire trip. 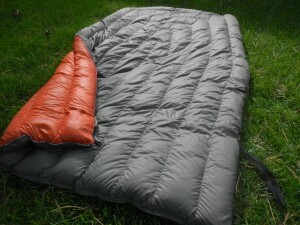 One of those items was my Minnesota-crafted Enlightened Equipment Revelation quilt. Not once did I regret my purchase, considering the multitude of sleeping systems available. Initially, I was attracted to using a quilt for both the weight savings and versatility – both proved to be stellar, in addition to other great features. Let’s dig in. I’ve had my fair share of cold nights while on backpacking trips, but during my AT thru-hike, I had not a single chilly night with this quilt. Since I’m a cold sleeper, a 10 degree rating seemed appropriate; initially, I worried I wouldn’t be able to find such a lightweight option for my needs. I was proven wrong in all the best ways. At a little over a pound, the Revelation will not weigh you down, or leave you feeling chilled in the middle of the night. 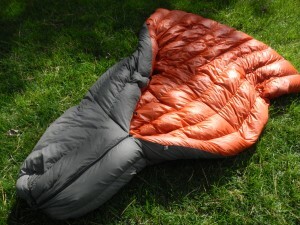 The ratio of weight:warmth with this quilt is outstanding. The Revelation comes equipped with a footbox zipper and drawstring cord, which allows the user to regulate their warmth by enclosing their lower legs. For cold nights, this means you’ll have toasty toes, and won’t have to worry about cold feet. During the summer, you can unzip the footbox and spread the quilt out like a blanket, which makes it easy to kick out a leg to cool off! Additionally, the quilt comes with elastic straps that wrap around your sleeping pad to help fully enclose you in the warmth, and eliminate cold drafts from seeping through the sides. I didn’t find myself using them much, but there were times when I was glad to have the extra security. Footbox, zipped up and tightened. The 800 FP down used in the quilt never seemed to lose warmth, no matter how many times I packed/unpacked it. The baffles stayed extremely lofty when the quilt was completely dry. Note: I did not use a stuff sack for this quilt. For my entire hike, it was either in my tent or stuffed into the bottom of my backpack with a trash bag liner. I feel that taking extra care to unpack my quilt ASAP, and keeping it out of a compression sack, helped to maintain its warmth and loft. I can also say that this quilt did not once get wet, other than occasional tent condensation- being steadfast about keeping your quilt dry is essential, since down loses almost all of its insulation value when wet. While my quilt never got wet, it did retain some slight moisture during the more humid sections of the AT, which is common for down products. To combat this, Enlightened Equipment offers DownTek, a water-repellent treatment for down. My quilt does not have DownTek, so when the humidity was high the quilt would lose a bit of loft, but never enough for concern. Spreading out the quilt in sunlight to dry quickly fixed any instances of moisture build-up, but on the AT sunlight is not always substantial. I would recommend opting for DownTek instead of regular down if you plan to hike in humid/wet environments. I have no plans to deviate from Enlightened Equipment for my sleep-system needs. The Revelation performed above and beyond expectations, and provided comfort for my whole thru-hike. It’s weight:warmth ratio can’t be beat (especially for the price! ), and it never suffered from warmth-loss. Enlightened Equipment also offers a huge variety of custom options, including colors and temperature ratings. If you are on the hunt for a new sleeping-system, your search can safely end with the Revelation. Disclosure: this product was not donated for review. I absolutely love my Enigma! And the DownTek is better than I could’ve imagined. Works like a charm. Do you have the 10D or 20D outer shell? I need to know if I should go with the 10D to save weight here, or if the extra water resistance would be a better choice. I always go with lighter. 10D 🙂 I think the downtek will do a good enough job of keeping stray moisture from causing problems. Hi! I’m looking into one of these for my 2016 thru. Do you keep your sleeping pad inside the quilt, and sleep right on top of it with the quilt wrapped around? Thanks! No Nichole, the sleeping pad does NOT go in the quilts foot box. EEs site tells you this if you read all the facts and hints. The fabrics will hold up fine unless subjected to the rubbing this would cause. Each quilt comes with 2 straps with clips that mate to the clips on the quilt. Put the strap around your pad. Then adjust the buckles in or out as you like. Or don’t use them at all. Best sleeping ever with these quilts. I am a female backpacker and am super disappointed with my EE quilts and wish I’d never bought them. Mine is supposedly rate to 10 degrees but I freeze in it below 45. I’ve tried every way of strapping it and the only thing that sorta works is buttoning it up like a sleeping bag and trying to sleep with the openings toward my xtherm pad. I bought one for my son and it’s supposed to be a 30 but he can’t bear it even on 50+ nights. Just wanting to put this info out there to balance the abundance of positive reviews which led me to this regretful purchase. A sleeping bag or quilt will not work if you don’t use the S.L.E.E.P mnemonic. Surface, will your sleeping mat cope with ground cold. Layers, wear a long sleaved top and bottoms. Eat, and or drink something hot before bedding down. Extremities, cover hands, feet and head when in bed. Protection, are you using a tent, tarp, or bivvy bag ? Smaller two skin tents retain more heat. What do you think ? Hello Silent Bob! I am looking at EE for my JMT hike this coming August. Did you take your 10* EE on your PCT hike last year? What mattress were you using as this makes or breaks the rating of the bag/quilt? I sleep cold and I do not think my Marmot Plasma 15 at 2 lbs will be warm enough. I am also trying to shave off some of my base weight too. Have you started CDT yet? Happy trails! Hi!!! Sorry I didn’t see this way sooner. I was away all spring and summer, and am now combing through my comments, and will be writing more. Good to hear from you! How did the JMT hike go? I have not done the CDT yet, I want to hike the Arizona Trail first. I guess my input is a bit too late now haha but, I did take my EE 10 on the PCT. It was perfect for me. I used a torso sized pad with it, and put my pack under my legs. If I needed a boost of warmth, I wore my hat and leggings to bed. I hike the PCT 2017. I had this 0 degree bag and i was freezing at night and i did strap it correclty. I came to the conclusion the the seller i called sold me a quilt too small for me. So i called them back after 3 weeks on trail. They told me their policy is only 40 days and i past it ( compared to a year for all other major sleeping bag companies) They didnt want to help me at all and prefered to let me freeze than exchanging it for a bigger one or give me the money back. Go for a feather friends, zpack or rei instead. Sorry to hear that. What sleeping pad did you use? I see you went with the EE 10 Degree Quilt. Did you ever think that a 20 Degree would have been sufficient on the AT or the PCT, and the 10 Degree Quilt was more than you needed? Which EE quilt would you now recommend for the AT? The PCT? Thanks. Oh, and would you recommend the 20 D Outer rather than the 10 D?